Combine strawberries, sugar, and cornstarch and let stand for 5 minutes. Bake pie shell until pie crust is slightly browned. 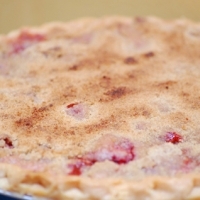 Fill pie crust (cooled) with strawberry mixture. Blend together flour, butter, brown sugar and cinnamon to form crumbs. Bake at 400F on sheet of aluminum foil for 45 minutes, or until crust is nicely browned. Serve warm or cool, with cream if desired. So what do we do with the 1/2 teaspoon of salt called for in the recipe but not mentioned in the instructions? Also, 3 pints of strawberries is way more than the 2-1/2 cups called for. East to make with a store bought crust - I added a handful of blueberries as I felt it could use a bit more fruit. Very nice! I just made this pie today. Our farmers' market had the ripest strawberries at 3 pints for $4, I had to buy them. The pie is really lovely. I will make it again. Two little thoughts -- make it in a 9 1/2" pie dish and also use weights when pre-baking the shell. The first one I made just wasn't ample in the 9" dish for all of the berries so I threw it out and started anew. And the pie was worth it - the color alone is superb. As promised, it is tasty but not overly sweet. This one will be on my table soon. Thanks for posting. Sounds decadent. Like verondear's recipes? Never miss an upload!